Redbricks Education Foundation is the brainchild of the founders of a global group with presence across various sectors such as clean energy, pharmaceuticals, genomics research and education. 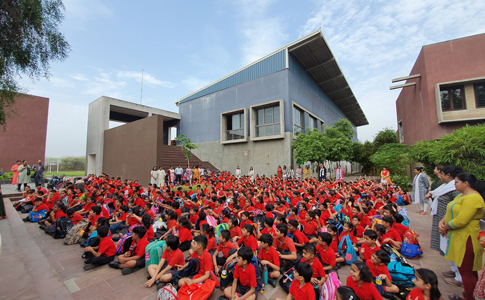 Our aim is to provide world-class quality education to individuals across all stages of life, spanning across the preschool years to higher education. We aspire to make global education practices accessible to the students in India, as well as develop best practices within the Indian context and culture. Our institutions of learning combine developmentally appropriate and relevant curricula, innovative teaching methods, excellent infrastructure and facilities, as well as nurturing educators in order to enact meaningful learning experiences that remain with an individual all through life. History provides testimony to the fact that India has contributed much to the world academically. Some of the oldest universalities of the world were cradled in India such as the prestigious Nalanda and Takshashila University. Indian scientists of a bygone era have created waves in the fields of science and mathematics. In ancient India, roots of mathematics can be traced to Vedic literature, which are around 4000 years old. The zero and pie are just the beginning. Its time we redeemed our lost glory. We aspire to produce great minds that can live up to the magnificent history of India's excellence in academics. To be a leading education provider that nurtures, educates, innovates and inculcates values to build the world's knowledge capital. To create institutions of learning for individuals at all stages of life. To evolve education practices to keep pace with a dynamic environment through pioneering research and innovation. To redefine learning experience by integrating modern techniques with traditional methods. To inculcate values that help develop a sense of ethics, morality and social responsibility.